NEWPORT/ATLANTIC BEACH -- From the Pacific Coast all the way to the Atlantic, three cyclists from Australia have biked across the U.S., raising money to donate to charity. 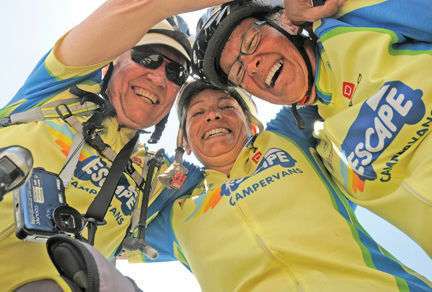 But for the trio, the ride wasn’t just about charity, but personal challenge. On Thursday, Brenda Noonan, along with husband and wife Don and Annie Bright and their support driver Pat Williams, arrived in Newport after cycling across the U.S. from Newport Beach, Calif. Ms. Noonan and Ms. Williams are from Newport in the Australian state of Queensland, and since they started from Newport Beach, Ms. Noonan called their journey “From Newport to Newport.” The Brights, meanwhile, are from Moorina, also in Queensland. Ms. Noonan said it was a journey of about 4,700 kilometers (about 2,920.45 miles). From Newport, the four did a “victory lap” of sorts, cycling down to Atlantic Beach, where they took their bikes down to the water’s edge, dipping their tires in the Atlantic Ocean, just as they had done in the Pacific Ocean in California on April 18, when their journey began. Ms. Noonan, the Brights and Ms. Williams were traveling across the country raising donations for the Cure Brain Cancer Foundation and the Cystic Fibrosis Foundation. Anyone who wants to donate to either foundation may do so online using links on Ms. Noonan’s personal website brendanoonan-onmybikeusa.weebly.com. Ms. Noonan said they’d raised about $2,000 in donations so far for the Cystic Fibrosis Foundation and about $6,000 for the cancer foundation, though she said they hope to ultimately raise about $5,000 and $10,000 for the respective charities. She said their reason for the journey wasn’t just to raise donations, however, but to challenge themselves personally. Ms. Noonan said she’s done four other long-distance cycling rides in the past, biking from the north of Scotland to the south of England in 2015, along the eastern Australian coast in 2014, across the length of New Zealand in 2012 and across the length of Australia in 2011. In 2013, Ms. Noonan participated in several 50 and 100 kilometer charity cycling rides. However, the major focus of the year for her was completing the Sunshine Coast Marathon, a running festival held in Australia. Heavy rainfall also gave the group some trouble while they were cycling through Georgia, making the roads dangerous. Ms. Noonan is the oldest of the cyclists at 63, while Mr. Bright is 60 and his wife 57. “I think it shows anyone can do anything if they set their mind to it and are determined,” Ms. Noonan said. The Brights, like Ms. Noonan, said the challenge was what drew them to take part in this cross-country journey. Mr. Bright said he enjoyed it immensely, particularly hearing all the different regional accents across the country and sampling the different kinds of food. Ms. Bright agreed with her husband, saying she also enjoyed the ride. “I’ve enjoyed all the people I’ve met along the way,” she said. Ms. Williams, who has accompanied Ms. Noonan on all her long-distance journeys, said as the group’s support driver, her job was to follow the cyclists in a van, which carried their luggage, food, tents and repair equipment. She too said she’s enjoyed the cross-country trip. “I’ve had plenty of time to read, play Sudoku and take pictures,” she said. With this fifth long-distance journey under her belt, Ms. Noonan said she doesn’t have another one planned at this time. Instead, she said she plans to volunteer her time as a cycling instructor for children back home. Contact Mike Shutak at 252-726-7081 ext. 206, email mike@thenewstimes.com; or follow on Twitter at @mikesccnt. Here is the on-line article from the Bladen County Press!! ​Click on the picture to go to the page! !